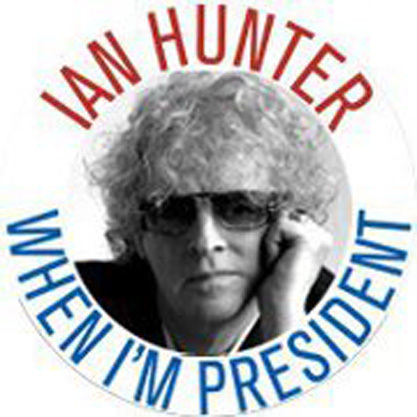 Who better to lead this party than Ian Hunter? He sings about wanting to be president but here in Northeast Ohio, he’s long been our unsung president. After all, he did write the song that would unofficially become Cleveland’s anthem, he has more than one set of keys to the city and on Wednesday, Sept. 26th Hunter will appear at a special fundraiser, wearing his I heart Cleveland badge proudly. The event will begin with a Q&A discussion at the Rock And Roll Hall Of Fame in the 4th floor Foster Theater at 7PM and will focus on Hunter’s unique relationship with former manager and dear friend Steve Popovich. The Vice President of Education & Public Programs Lauren Onkey will lead the conversation, bringing to light the impact of Popovich, Cleveland International Records and his unwavering passion for music. Following the event at the RHOF, VIP Donors (tickets available for $200.00) are invited to a special reception from 9PM to 11PM with Ian and his wife Trudi at Crop Bistro, for some hors d’oeuvres and cocktails. Cleveland International memorabilia will be on display and undoubtedly it’ll be a night to remember. Cindy Barber co-owner of the Beachland Ballroom is the one spearheading this initiative. Obviously, it will benefit Cleveland in numerous ways by focusing on its mission which includes; The Popovich Legacy Project, Cleveland Rocks Now, Music Saves The Future and Keep It Live. The non-profit will concentrate on preserving Cleveland’s rich musical history while reinforcing the idea that its music scene is still very much alive. The ‘Cleveland Rocks PPF’ mission provides more detail in the press release and for the record; Weird and Gilly fully support this effort and look forward to cheering it on in every way possible.